Discussions on software, design, and software design. Laevo is a personal information management tool for Windows 7 and 8 which offers you additional functionality by which to organize your work, with a particular focus on supporting multitasking. Our goal is to do this without changing the everyday interaction with Windows drastically. In case you have ever used a virtual desktop manager the general concept will seem quite similar, but in essence we are striving for much more, and several additional features are already available. What is a virtual desktop manager? When using a virtual desktop manager, you have not one, but several desktops available to you between which you can switch easily. An over simplified analogy would be having several PCs available to you, each running their own programs and being able to switch between them without having to change seats. The two core concepts which Laevo supports are activities and to-do items, comparable to many existing calendar and planning tools. 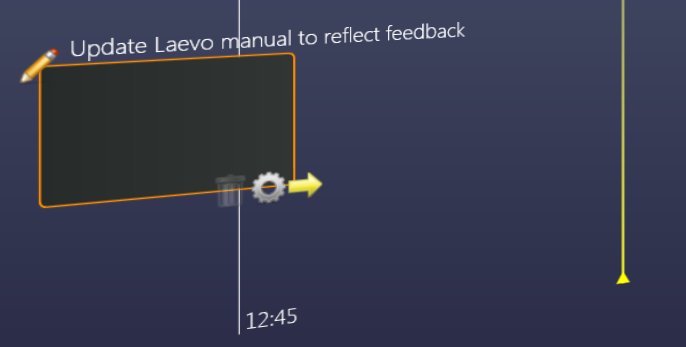 Laevo effectively tries to integrate your calendar into your desktop environment. Activities: these can be seen as the entire context of a certain task you are working on, worked on before, or are planning to work on at a predetermined time. E.g. when writing a report you might be working in a text editor, but you also might need relevant emails of your supervisor and additional information from certain web pages. For each activity, Laevo offers you the opportunity of creating a separate virtual desktop, giving you a clean slate to work on. To-do items: these are very similar to activities. The only difference is they represent work that still needs to be done, without having specified when. Like activities however, they can still hold their own context on a separate virtual desktop. After Laevo has started, you won’t see much of a difference. As stated before, our goal is to intrude as little as possible in your daily work. You can find Laevo as a tray icon in the bottom right. It might be hidden, in which case you will need to click the little triangle in order to find it. We advise you to go to “Customize” by clicking the triangle and setting Laevo to “Show icon and notifications” so that it is always visible. The Laevo icon will light up when you have received a new email in case you entered your Gmail credentials. Double clicking the icon will open up a full screen overview of your activities and to-do items, presented on a time line. Alternatively (and recommended) you can press Caps Lock (named Shift Lock on some keyboard layouts) to show or hide the overview. The key’s traditional behavior has been overridden, and all short keys of Laevo start out with Caps Lock. You can still enable/disable Caps Lock by pressing Caps Lock – A. Since you haven’t created any activities or to-do items yet, the time line will be empty, but as will be shown shortly the time line might be populated as follows. Time is presented on the horizontal axis, and activities as work occurs on them (possibly in parallel) are organized on the vertical axis. Try click-dragging to move the time line around, and scrolling to zoom in/out. The yellow vertical marker indicates the current time. Activities which are currently being worked on continue expanding, getting wider and wider, as long as they aren’t closed. In the image above, there are two activities currently open, and two closed ones which were open in the past. Additionally, activities can be planned in the future at a specified time, as shown by the activity with the black background behind the yellow marker. At the bottom you can find a list of to-do items, represented by icons. Next to it you can find a bigger “Home” icon, representing the desktop you were working on prior to starting Laevo. Clicking it brings you back to your original desktop. Clicking an activity or to-do item opens up a clean desktop in which you can work, exactly the same as the original Windows desktop, but only showing windows for that activity or to-do item. Press Caps Lock – N; a clean desktop will show up. You have just created your first activity, and immediately have started working on it. For now it is empty. If you go back to the overview you will see a “New activity” on your time line with a yellow border, indicating this is the activity which is currently open. Click dragging the activity allows you to choose where to place it vertically. Hovering over it with your mouse pops up a menu with 3 icons. A garbage bin, a gear, and a close button. Garbage bin: removes an activity from the time line. You can only remove an activity when it is no longer open (you aren’t working on it) and there are no windows open in it. 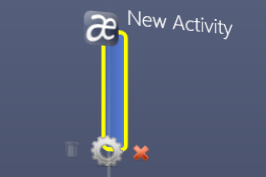 A closed activity which has windows open inside of it has an orange border. Gear: opens up a menu in which you can give the activity a name and icon. You can also adjust the name of the activity directly by clicking the label on the time line. Close: indicates on the time line that you are no longer working on the activity. However, you can still access it as you would otherwise just by clicking on it. It is up to you to decide when you keep an activity closed or open. For each activity, there is a directory which is automatically created in which you can place relevant files. 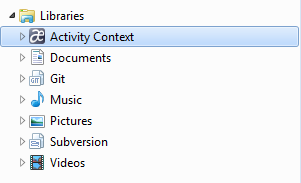 When inside an activity (on the desktop) this directory can always be accessed from Windows Explorer under the “Libraries” list, named “Activity Context”. Alternatively, you can open up this library when inside an activity using Caps Lock – L. You can even add additional folder locations to the library to import existing files. For more information on Windows Libraries, check out the official documentation. You can cut and paste windows, just like you cut and paste files, in order to move them from one desktop to another. Highlight a window (click on it) and press Caps Lock – X. The selected window will disappear. Press Caps Lock – V to show it again. You can cut multiple windows in a row; when pasting, all previously cut windows will show up again. By cutting windows when inside one activity, and pasting them when inside another, you can move windows in between activities. Clicking the “+” icon on the overview adds a new to-do item. As you will notice they behave very similar to activities, you can also click on them to open up a new desktop to work on. New to-do items show up on the left hand side. You can drag the icons left and right to organize them. Once you decide to start working on a to-do item you can drag it to the time line, effectively turning it into an activity. Start working: when you drag the icon in front of the current time marker and drop it you will convert the to-do item into an open activity, indicating you start working on it. Plan: you can drag it behind the current time marker, positioning it where you are planning to work on it. Through the edit menu you can change the date and time more accurately in case needed. You can start working on a planned item by clicking the yellow arrow in the mouse-over menu. To plan to-do items you can also open up the context menu on the time line (right mouse button) behind the current time marker at the location where you want to place the activity, and clicking “Plan activity”. Assign: drag a to-do item to an existing activity (or the home icon) in order to make it part of that activity. All windows open in the to-do item will be merged with those from the activity. In case you provided login information for Gmail, new emails will show up as new to-do items with an animated yellow border, until they have been opened. Opening an email “interruption” will besides opening the desktop also open up the context of the interruption; in case of Gmail, the email will open up in a new browser window. When you want to shut down Laevo, right click the tray icon, and select “Exit”. 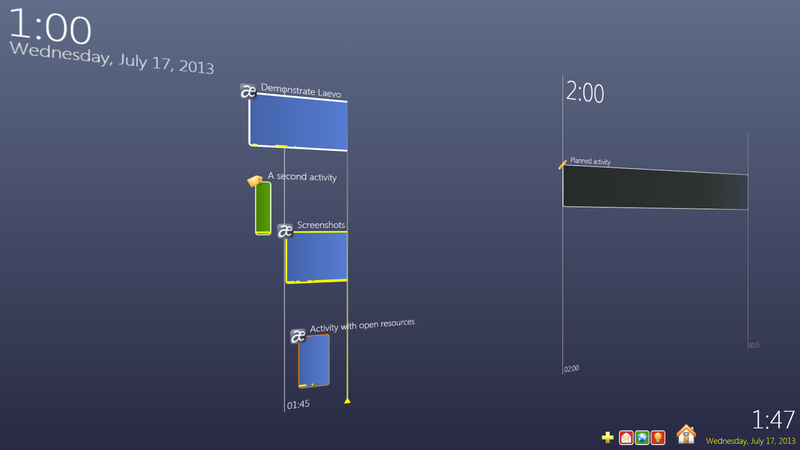 All open windows from all your activities and to-do items will show up again. All activities are closed when shutting down Laevo, and will be represented as such when Laevo is restarted. When restarting Laevo, the windows which were previously part of an activity or task context will be reassigned to those and thus be hidden upon startup. All new windows, not previously part of any activity or task, become part of the “Home” activity. Since all activities close when exiting Laevo, the activities which were open at the time Laevo was shut down won’t stretch up to the current time after a restart. You might need to zoom out and/or move the time line to the past to find them. 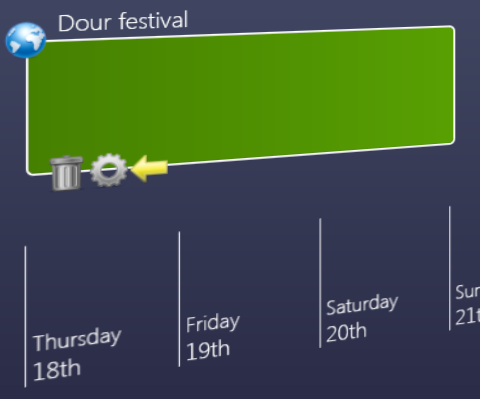 By clicking the yellow arrow you can make the activity stretch to the current time again, indicating that work on it is continued. In case the time line overview is running a bit slow, try lowering the quality in the settings which can be accessed through the context menu (right click) of the tray icon. During development AVG also bothers me quite often with virus warnings. Laevo does a lot of hackery to get what it does working. E.g. it installs a global key hook in order to get Caps-Lock to work as a modifier key; it tracks processes in order to see whether the log-on screen is accessed (and in future versions to capture command-line arguments); a lot of low level Win32 calls access window information; etc … The entire source code is open source in case you are worried, but you have my word there is nothing (intentionally) malicious with the installation. That aside, pretty soon I will release a new version with some new features, so stay tuned. I will be looking for some new testers again. Just curious, is this still WIP? Do you know any other initiatives in the same direction? This work was part of my PhD thesis which I have since defended. If your interest is conceptual, I believe the best way to answer your question in full is to send you my thesis (it is not yet on line), or you can watch my defense (https://www.youtube.com/watch?v=Wu3VRMraPgQ). In short, there have been many research initiatives in this direction, but it is industry really which needs to pick up the ball. Several times throughout this dissertation I have highlighted how much the design of interactive computing systems relies on, and is influenced by underlying architecture . Therefore, design and computer science (as practiced in HCI) are—and are likely to remain—extremely interconnected. This is a fundamental limitation for an activity-centric approach to system design, which envisions a radically new computing paradigm incompatible with the current antiquated desktop metaphor for office work. Building activity-centric computing systems is a continuous uphill battle against an industry which is only trying to achieve local maxima. In contrast, activity-centric computing pursues radical innovation, aiming for one unifying global maximum. To conclude this dissertation, I will reflect on how current efforts in this line of research have only accomplished incremental innovation, and will base a vision for future work on an analysis of early interactive computing systems (less restricted by prior infrastructure) through the use of the interaction framework. If your interest is technical, all code is open source. Is Microsoft finally embracing ubiquitous and activity-centric computing with Microsoft 365? Fluent Design System in Windows 10: Aesthetics over Usability?